Platinum Games has concocted a new brand of action hero in Bayonetta, an angel-slaying witch with long legs, long hair and a long list of heavenly creatures who want her dead. The action game directed by Devil May Cry creator Hideki Kamiya offers a new alternative, but a familiar gameplay style for the fan of Capcom's shoot and slice 'em up series, something new for the Ninja Gaidens and God of Wars of the world to aim for. And it's not just Bayonetta's weapon arsenal, though she can wear a gun—or claw or ice skate or bazooka—on each hand and each foot, leading to a dizzying array of combos. She can also exact vengeance on her angelic foes with the magic of her hair, the black locks that act as both costume and, when needed, a giant, enemy shredding beast. Is this action heroine a welcome addition to the Dantes, Ryus and Kratoses of the genre? Witch Time & Quad Damage: The best aspect of Bayonetta? The deep, fluid, play-to-your-preference combat, made all the more interesting by a wealth of weapons, combinations and the delightfully fun Witch Time. That's the dodge at the last second mechanic that lets Bayonetta hack and slash and shoot in her own take on now-classic bullet time. Witch Time is meant to be used liberally, via a well-timed flick of the right trigger, and makes experimentation with Bayonetta's move set and weapon suite—whips, swords, shotguns, et al. applied to both hands and feet—tons of fun. A Dull Moment? Why I'd Never! Action game fans will not hunger for over-over-the-top frenzied gameplay in Bayonetta. The game administers a constant drip of high octane fisticuffs, swordplay and gunplay that manages to regularly one-up itself over the course of the game's substantial length, throwing at the player more and more spectacular bosses and ridiculous circumstances for Bayonetta to effortlessly overcome. Not that these the player will find the gameplay effortless, necessarily—more on that later—but whether Bayonetta is battling Angels twenty times her size, riding on the back of a rocket, or surfing the lip of a mile-deep whirlpool, she does it with cat-like grace that juxtaposes beautifully with the chaos flooding the screen. Thanks to the game's ornately and cleverly designed part-angelic, part-demonic bosses, Bayonetta is (almost) never dull. Visual Style: Bayonetta's gilded and glitzy aesthetic will likely have as many detractors as fans. But I'm a fan of the game's Vegas Strip visual intensity and costumes as subtle as Liberace's stage wear. It's gaudy, silly and full of impractical designs, but it's rarely if ever brown and boring. Bayonetta's personal appeal, as illustrated through her hip-thrusting and long-legged kicks, may wear thinner by the end of the game—as does the black witch hair offering titillating glances at her nether parts—but it is at least refreshing not to see a protagonist brooding and bulky. Normal Is Normal, Hard Is Hard: At its default level Bayonetta offers a challenge. Certainly not an insurmountable one, but enough pushback from enemies and numerous bosses to make the game as hard as games like this should be. Platinum Games is generous with checkpoints and saving opportunities, offering two levels of difficulty above "normal." Having failed often in the next difficulty level up, I'm fairly confident that even gamers better than me will find an appropriate challenge in "hard." Vs. Jeanne: Though they may be the least visually impressive of Bayonetta's many encounters, the battles with her white haired foil Jeanne are often the most interesting from a pure gameplay perspective. These hand-to-hand fights against Bayonetta's equal require some of the most demanding reflexes, offering the most intense battles. It was against Jeanne that I learned to appreciate Bayonetta's battle system and weapon switching. It's also against Jeanne where you'll use the wall-climbing Witch Walk mechanic most. Heaven or Hell: Bayonetta is fortunate enough to have access to multiple realities, letting her access portals to Alfheim and to the Gates of Hell. The former lets players take part in mid-chapter battles of a puzzle-like nature, restricting them to a certain number of punches and kicks or to Bayonetta's Wicked Weave hair-based magical attacks. If you want to really play Bayonetta, unlocking everything, you'll find an impressive challenge in the hidden Alfheim portals. The Gates of Hell ensures that players will want to return to a "new game+" playthrough, purchasing and unlocking everything. In the Gates of Hell, all new weapons, techniques and accessories await the player. And given their price, it may be a long time before the Bayonetta fan has seen everything on display. Devil May Cry Too: Look, if you like Devil May Cry, you're most likely going to love Bayonetta, the spiritual successor to the Capcom franchise that has varied in fan reception over the years. Hideki Kamiya, director of Bayonetta and the original Devil May Cry, also takes time to include nods to some of his other games, like Viewtiful Joe and Okami. 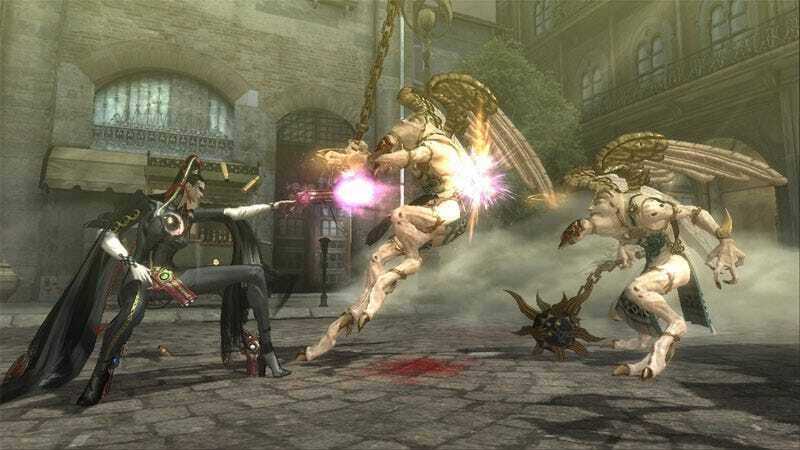 But if you simply enjoy the Devil May Cry upgrade and combat systems, you're going to find much of Bayonetta fondly familiar. Sega Throwback: And if you happen to be a Sega superfan, the publisher of Bayonetta's past is also well referenced. The gags aren't worth spoiling here, but a handful of Bayonetta's weaker, gameplay-switching chapters are made infinitely better by goofy nostalgia. The Ugly Sister: As followers of the game are likely aware, the PlayStation 3 version falls well behind its Xbox 360 sister in a handful of technical aspects. There are frame rate and loading issues with the PS3 version, both of which detract from the fluidity of the experience, particularly if one spends time with the 360 version. The loading frustrations are not just limited to between-chapter breaks, either, as the game will pause to load when picking up items. The Xbox 360 version, while mostly consistent in its frame rate, suffers from some noticeable screen tearing. It's more obvious during the quieter periods, not as much when engaged in battle. Lock Off, Featherface: Bayonetta's camera is a chore to deal with at times, sometimes pulling the view away from enemies at crucial moments. It's slow to catch up or control at others. The default setting for camera manipulation is painfully slow, something the user can tweak, but it's the reliance on locking-on to an enemy for reliable camera angles that can be frustrating. It may be difficult to convey how much fun it is to play Bayonetta without touching on the thousand things that make the game memorable. Over the course of my first 16-hour play through of the game, Bayonetta showed me one ridiculous cinematic battle after another. The game's memorable, puzzling bosses may be the biggest draw for their visual spectacle, but it will be the deep, fluid combat that will keep action game fans hooked after the visual splendor wears off. Now, Bayonetta does have a hitch or two. The story driving moments that interrupt all that action wears out its welcome quickly. A handful of verses that involve driving sequences and controlling mounted turret guns detract from the overall experience. Especially the turret gun nonsense. Fortunately, those cut scenes can be skipped. Turret gun sequences should be given the same courtesy. For the gamer not put-off by the Devil May Cry school of design, there's much to like in Bayonetta. It's a ludicrous, oversexed romp that one shouldn't take too seriously, just as its creators seemed to have done. But Bayonetta should be enjoyed immensely. Bayonetta was developed by Platinum Games and published by Sega for the Xbox 360 and PlayStation 3 on January 5. Retails for $59.99 USD. Two copies of the game were purchased for reviewing purposes. Played Xbox 360 version to completion on Normal difficulty, further testing Hard difficulty. Played first three chapters on PlayStation 3 version.